I have a few more IMG-produced badges. If you’d like photos just let me know. Ken, I would be delighted to see them! 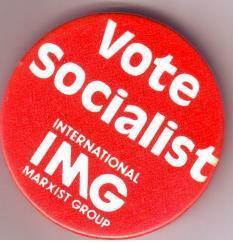 Didn’t the ISG make those cute little Fourth International hammer-and-sickle buttons? Red and black, of course. Here is something which may be of interest to you – Neil Young busking outside Glasgow Central station in 1976. Two socialist newspaper sellers can be seen on film – one “Socialist Worker” and one “Red Weekly”. Many thanks. I wonder who they are? The Socialist Worker seller is Brian Lavery, now a celebrated naval historian: the Red Weekly seller is Alan Freeman, then the Ross tendency’s man in Glasgow, now attached to Socialist Action and Historical Materialism. 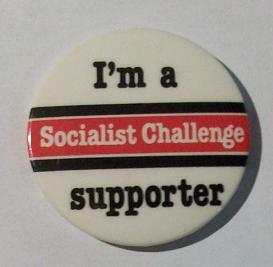 I will try to come up with those badges that ‘legatte’ mentioned as I got them from supporters of the International Majority in ’73 Chicago (I believe). It was a special USSWP convention on international issues and a full Young Socialist’s one after. 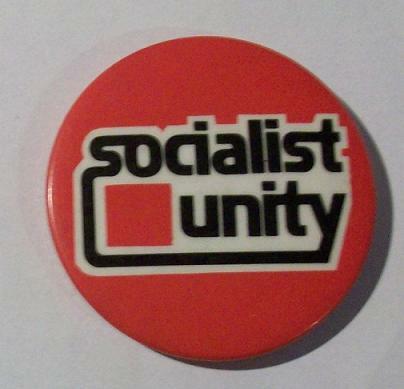 A steward’s badge from the 1979 joint NAC-TUC demo (I used to have the armband too, don’t know where it went). There were two Benn badges. The less polite one said: BENN FOR DEPUTY, BUT SHOOT THE SHERRIF FIRST. That would be a real collectors item.